Google’s local search interface which organizes search results around specific locations. Rather than being dependent upon information indexed from a business’ website, Places uses information (including customer reviews) gathered from a variety of sources. In addition business owners can claim and customize their places listing. Places rankings are different from ranking in regular Google SERPs. 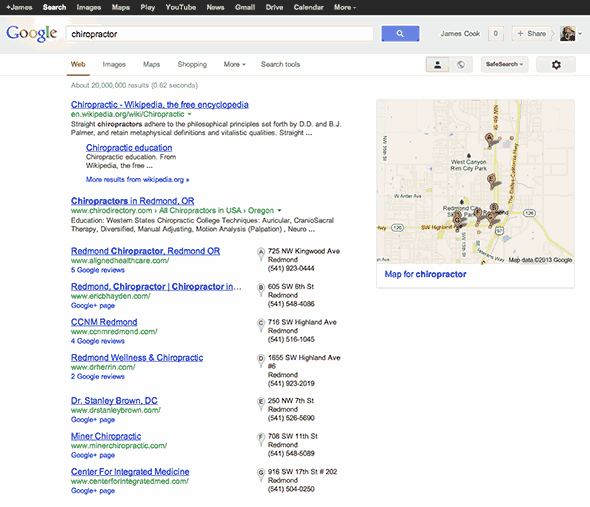 For example Chiropractor A may outrank Chiropractor B for the term “chiropractor” in Google Search but appear below Chiropractor B in Places search results. Since Places listings are limited to a geographical region, it is often easier to rank well in Places than in the traditional SERPs. Also, Places results – being local – are more targeted. In addition to appearing in Google Map searches, Places results have also been integrated into regular SERPs in a variety of ways. See graphic below.